Immigrant rights, anti-police brutality activists insist on action at first meeting of new Minneapolis city council | Fight Back! 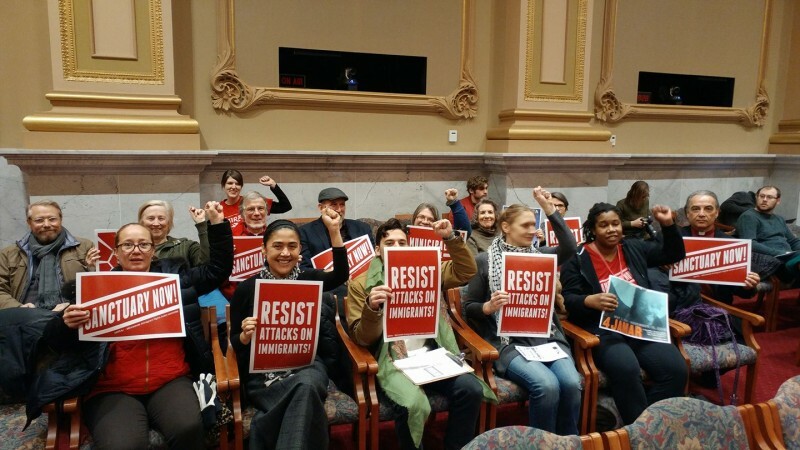 Minneapolis, MN - On Jan. 12, the Minnesota Immigrant Rights Action Committee (MIRAC) and the Twin Cities Coalition for Justice 4 Jamar (TCC4J) made their presence felt at the first meeting of the newly-elected Minneapolis city council. Before the start of the city council meeting, the groups held a press conference at the Father of Waters statue inside the City Hall rotunda, where they explained that they will stand together to demand that the new city council members take immediate action toward making Minneapolis a true sanctuary city for it’s immigrant residents and for community control of the police. The city council meeting was very short, and as they were about to adjourn, the activists asked to speak. After a couple minutes of council members discussing whether to allow the public to speak and what parliamentary motions were needed to do that, the council finally suspended the rules and Erika Zurawski of MIRAC and Loretta Van Pelt of TCC4J spoke directly to the members of the city council about the urgency of passing the Sanctuary Platform and community control of the police. On Sept. 20, 2017, MIRAC publicly launched their campaign for Sanctuary Now in Minneapolis, unveiling a 13-point Minneapolis Sanctuary Platform for immigrant residents of the city. A key part of the platform is a municipal ID for all city residents. One of the 13 points was passed in the final sessions of last year’s city council, and MIRAC is pushing for rapid action on the other 12 points. From Jamar Clark to Justine Damond, unarmed innocent civilians are killed by Minneapolis police who are not prosecuted, disciplined or held accountable in any way. On Oct. 20, 2017, the Twin Cities Coalition for Justice 4 Jamar and family members of Jamar Clark called on the city council to establish a Minneapolis Police Accountability Council, and true community control over the police. The activists from MIRAC and TCC4J pledged that they will continue to organize until the city takes action.